The home screen of "Miao Mi." A new app that helps young children learn Mandarin has launched today in the United States. 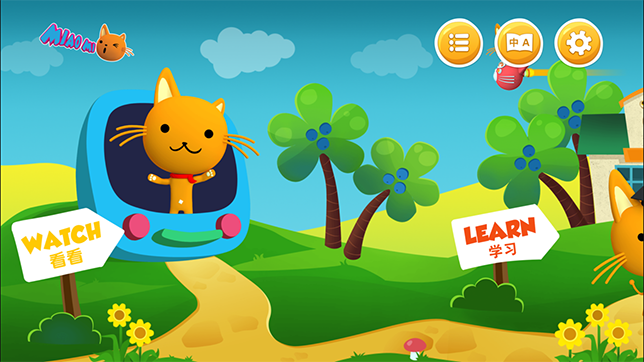 “Miao Mi” features more than 500 videos, including award-winning children’s programs from Asia, and games that reinforce language learning. The app is available on the Apple App Store today and on Google Play in May. It’s free to download, and $5.99 per month to subscribe. A 7-day free trial is available. “Miao Mi” is a well-established Mandarin edutainment cable TV channel in Asia. The app is already enjoyed by millions of families across Asia, according to a news release. The programs on the “Miao Mi” app offer an immersive experience for preschoolers at different stages of mandarin language learning. Children and parents with no prior exposure to Mandarin can easily pick up the unique sounds of Chinese as well as those from Chinese-speaking backgrounds, the company said. The “Watch” section offers shows in Mandarin or English and reinforces vocabulary usage in context. The “Learn” section showcases “Miao Mi Classroom,” short videos which help children learn simple vocabulary by teaching them phrases and words with animated flashcards and catchy songs. The app also features fun and interactive games using “Mao Mi’ characters and simple Mandarin words. The vocabulary level on the app matches what K-2 students in Mandarin immersion programs across the United States are learning, helping to prepare children who may enter those programs in the future, the company said. A secure and ad-free environment, the “Miao Mi” app features a child-friendly navigation interface and English/Mandarin language support. The shows on the “Miao Mi” app include “Star Babies,” an acclaimed animated series inspired by Chinese icons such as Bruce Lee and the Monkey King, and “Pleasant Goat Fun Class,” an educational series featuring beloved characters from the popular Chinese “Pleasant Goat” kids franchise. To download the “Miao Mi” app, go to the App store for iOS. “Mia Mi” the TV program is also available in the United States through Amazon Prime Video for $5.99 per month. A 7-day free trail is available. For more information on the program, visit the “Miao Mi” website.